I hadn't planned any trips for Summer. A family function at home meant I'd have to travel and decided to make it a short holiday at home. I could manage a few days at home by combining a holiday and some leaves. The function was on April 12, while April 14 was a holiday and April 15 was our New Year. Tickets for 14th night was not very costly, so were tickets for April 15th morning. 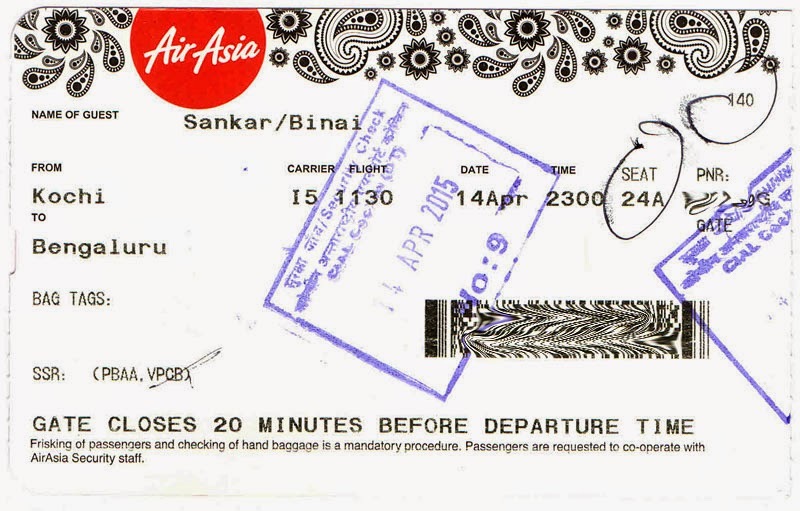 I went ahead and made a booking for April 15th morning, on AirAsia flight 1124, so that I can reach office by afternoon. I had that eerie feeling when I made the booking - will AirAsia again reschedule the flight and throw a spanner into my plans? AirAsia has never been on schedule, and has rescheduled my flight every time I flew them the past three times. That feeling did have some substance. As the date of the flight came closer, I casually checked flight schedules and the ticket rates for my day of travel - the first thing that caught my attention was that my flight was now scheduled to leave a full hour after original schedule! I was terribly upset with the reschedule - I now stand to lose an entire working day. 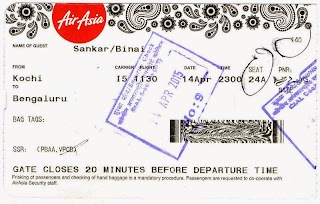 A day later, I officially received a re-schedule intimation from AirAsia - it was not only a reschedule, but the flight number too changed, from 1124 to 1126, and the departure was pushed from 1040hrs to 1140hrs. I was undecided on the future course of action - but decided to wait and watch. In the meantime, I went about looking at the alternative options. I finally decided to call up AirAsia and find out what options I had. One fine morning, I call up the AirAsia India Call centre. After going through an IVR, I was connected to the Customer Support Executive. The voice quality was awful, but the agent was really helpful. He heard my queries patiently, took down the Confirmation number and retrieved my booking. He offered to reschedule my booking to the previous night flight - I confirmed without a second thought. I had to hold for a couple of minutes - AirAsia has great music selection, I must say - at the end of hold, he confirmed that I had been rebooked on AirAsia 1130, departing at 2300hrs, the previous night (April 14th). No charges were levied, and the agent held on till I confirmed receiving the new itinerary in my mailbox. I rate their Call Centre a lavish 5 on 5. The entire call took under 6 minutes, and left me fully satisfied with their service. I was sad that I had to return a night earlier - but saving a leave was more important. Like everytime, I decided to leave home very early. 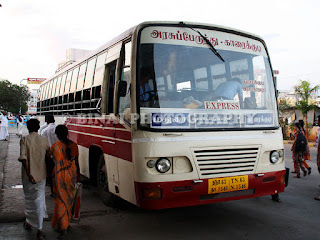 My dad dropped me at the nearest town (Kodungallur) sometime around 7.30pm. 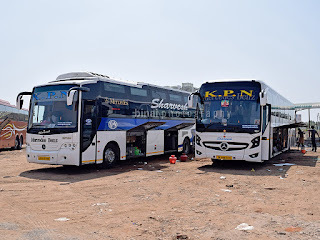 I got buses very quickly, and I reached National Highway 47 (now 544) very soon - I had over an hour to go for the check-in deadline, and hence decided to take a chance and wait for a bus. I waited until around 2115hrs - no bus turned up. I suddenly remembered that Ola had started operations in Kochi - the Ola App came to my help, and a cab arrived in another 10 minutes. The cab took off to the airport - and I got busy talking to the driver about how his life is doing. He was happy driving for Ola, and said he gets a lot of trips. 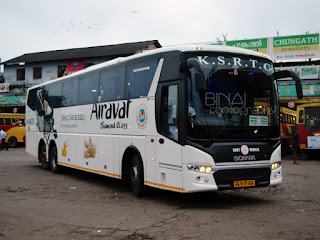 Their fares are very competitive, and has helped attract a lot of passengers. I was dropped at the airport at around 2145hrs. The airport appeared quite crowded - thankfully, the AirAsia check-in counters weren't crowded, and I got through by 2151hrs. Security check was very crowded, and it took some time to get through. 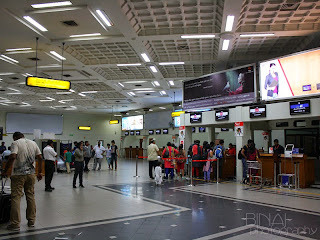 I was in the security hold by 2200hrs - still an hour to go for my flight! A few months back, the security hold at COK was extended. There are a lot of seats now. I headed to an corner, searching for a power socket - finally found one near gate #4 (I've never seen this gate being used) and settled there. My going there did raise a few curious stares from the security staff. I plugged in my phone and connected to the Airport's WiFi system (worked for the first time, for me), and browsed the internet for some time. I kept tracking the incoming aircraft - it was VT-ATF for me. The incoming aircraft landed at 2238hrs - meaning, we could depart on time. Quite unusually, they did not call boarding as soon as the aircraft came in. 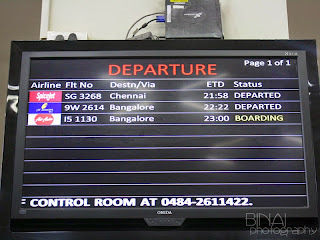 The first boarding call was made only at 2246hrs. Of course, by the time the announcement was made, a long queue had formed. Boarding was through Gate 1 - I joined the queue when most of the people had boarded. 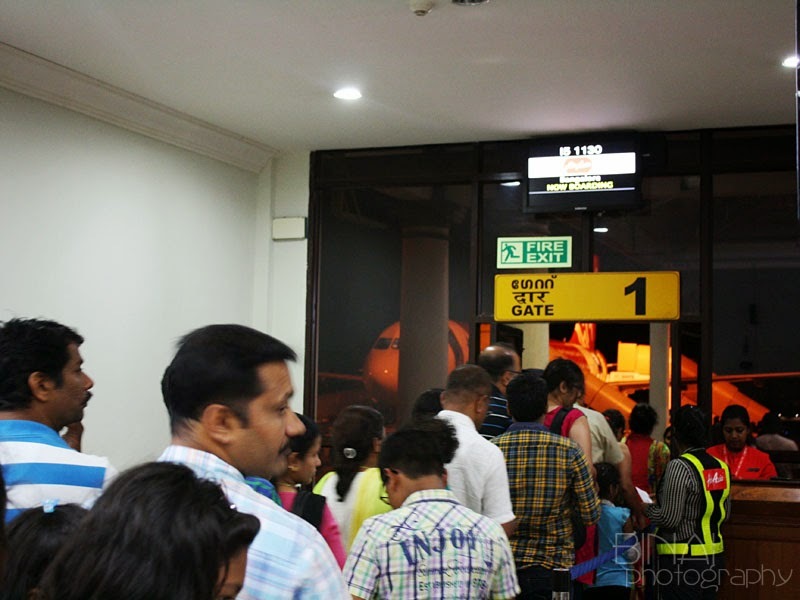 There were lots of group bookings - people had 4-6 boarding passes each, and it took a bit of time with the CISF people taking their time to check each baggage and boarding pass. I boarded through the rear door, since I was seated in #24A. I usually select seats at the front, but had to choose one at the back this time. I was inside the aircraft at 2252hrs. The FDIS at COK. Mine was the last flight of the day! Boarding in progress from Gate #1. Thats the aircraft in the background. The first observation was that seats at the back was very tight - very less leg room and felt congested. Boarding was completed at 2257hrs - we had a full flight today (for the first time in my 4 flights with AirAsia). It took some time for the ground staff to get off the aircraft - doors were finally armed at 2303hrs, and we were all set to go. We were pushed back at 2305hrs - soon after pushback, safety demonstration began. In the deck were Capt Vijay Jose (my third flight with him) and Capt Manish Uppal. The cabin had 1 male and 3 female FAs. 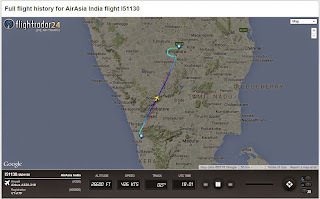 We were tata'd off at 2310hrs, and we began the long taxi towards Rwy27. In the meantime, the Capt Uppal came on PA and announced that we were delayed due to air traffic congestion, and bad weather in Bangalore. He added that we were expected to land before time, and that he would get back to us with more details once we were airborne. We reached the runway at 2315hrs, and were airborne at 2316hrs. Take offs from Kochi are always beautiful - be it day or night. I feel special everytime I take off from Kochi - and love the way the aircrafts bank soon after take off. Seatbelt sign was switched of at 2320hrs - and we hit a pocket of turbulence at the very moment, prompting the pilot to switch on the seatbelt sign once again. The seatbelt sign was switched off again at 2324hrs. A flurry of announcements followed about on-board sales, etc. The trolleys came out, and they started serving passengers who had prebooked a meal - I too had booked one. But before they reached my seat, turbulence hit us again, and the seatbelt signs were back on. After sometime, the service restarted, but the seatbelt sign remained on for the remaining part of the journey. I had booked a Vegetable Pasta in Tomato Sauce. 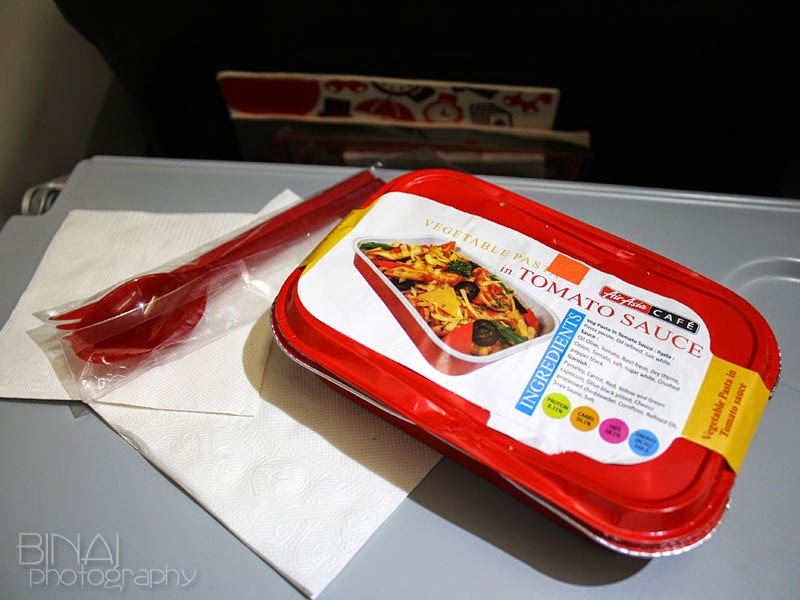 My meal was served hot, as usual, in the characteristic red coloured aluminum disposable container, with plastic cutlery (also in red colour). 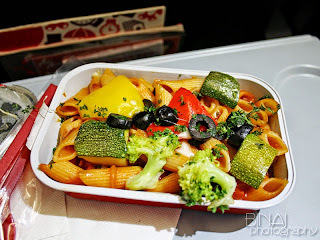 Vegetable Pasta in Tomato Sauce! I opened the container to find Pasta Penne cooked to perfection in a slightly sweet Tomato sauce, garnished with capsicum in different colours, broccoli and some other vegetables topped with Cheese. The meal was served hot (as usual), and tasted really good. I understood that the catering is handled by Taj-SATS. I relished the meal taking my own time, enjoying every bit of it. We did keep having turbulence on-and-off - but not serious. The on-board service was wrapped up quickly and the crew came around for clearing the trash. Sometime around 2340hrs, Capt Uppal came on the PA once again, and briefed that we were cruising at FL250, and had began descend by then. 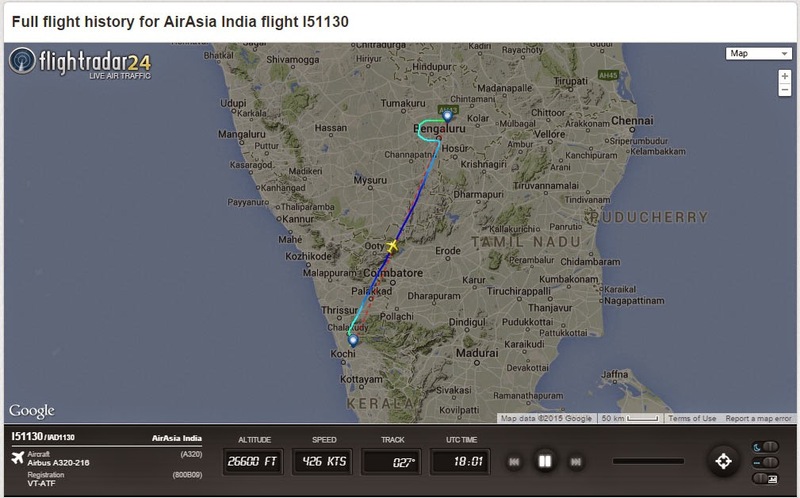 He briefed passengers about bad weather in Bangalore, and associated congestion there. He said that our landing sequence wasn't yet known, but were likely to be delayed - and signed off with a promise to update us as soon as information is received. At 2345hrs, the Capt came on the PA yet again, and announced that we were 4th in the queue to land, and were expected to land five minutes past midnight. This was followed by the routine set of pre-landing announcements by the cabin crew. Quite interestingly, soon after the normal announcements, the purser asked all cabin crew to be at "demo positions" - I was quite confused at what was going on. 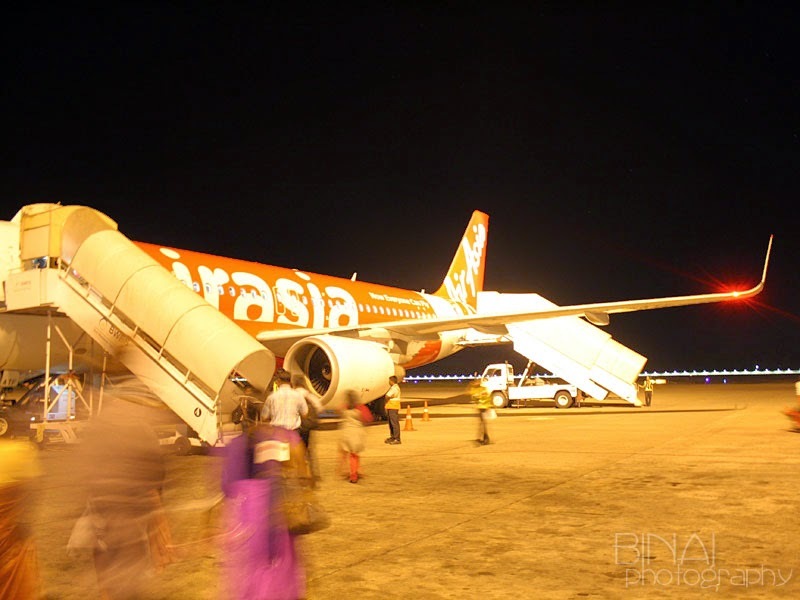 Once the attendants were at their "demo positions", a round of "thanks for flying AirAsia" announcements followed, with the traditional 'Namaskaar' sign off. That was a nice touch - giving a well deserved Indian touch. We finally touched down on Rwy09 of Kempegowda International Airport, Bengaluru at 0002hrs - 3 minutes before our estimated touch down time. It was a long taxi to our bay, and we finally parked at 0006hrs, at Stand #22. Being a Jetway stand, it took sometime for the doors to be opened. I finally got off at the aircraft at 0014hrs. Given the hurry of Indians to get off the aircraft, de-boarding was real quick. It took just around 10 minutes to empty a 180-seat A320! I was out of the airport at 0021hrs. Except for the reschedules, and tendency to be late always, I love AirAsia. Its a perfect leisure airline - except that they might spoil your holiday plans. Their catering is something the other LCCs should follow - they serve some great food and not so heavy prices. Its an airline you can choose if you aren't bothered about being a bit late. End Note: The flight I was originally booked in (I5-1124, then renumbered to I5-1126) was rescheduled further, to leave at 1355 instead of 1140! I thanked my stars for taking that decision to fly back the previous night - had I opted to fly as planned, I might have ended up in Bangalore only in the evening!